Still Searching for a all Cadillac XT4 Near Overland Park or Olathe? Finance for $682 per month at 3.9% APR for 60 months with $4,509 down payment. Payment expires on 04/30/19. Estimated Finance payment based upon 3.9% APR for 60 months, with a down payment of $4,509. Excludes title, taxes, registration, and license fees. Some customers will not qualify. See your authorized dealer for complete details on this and other offers. Residency restrictions may apply. Lease for $443/month for 39 months with $4,509 due at signing including $0 Security Deposit and 10,000 miles per year. Payment expires on 04/30/19. Estimated Lease payment based on 39 months and $4,509 due at lease signing. Cash due at signing includes $4,067 capitalization cost reduction, which includes $650 acquisition fee, plus a required security deposit of $0, and first month's lease payment of $443. Excludes title, taxes, registration, and license fees. Total monthly payments equal $21,312. Mileage charge of $0.25 per mile over 10,000 miles. Not all consumers will qualify. Residency restrictions may apply. Finance for $751 per month at 3.9% APR for 60 months with $5,374 down payment. Payment expires on 04/30/19. Estimated Finance payment based upon 3.9% APR for 60 months, with a down payment of $5,374. Excludes title, taxes, registration, and license fees. Some customers will not qualify. See your authorized dealer for complete details on this and other offers. Residency restrictions may apply. Lease for $400/month for 39 months with $5,374 due at signing including $0 Security Deposit and 10,000 miles per year. Payment expires on 04/30/19. Estimated Lease payment based on 39 months and $5,374 due at lease signing. Cash due at signing includes $4,974 capitalization cost reduction, which includes $650 acquisition fee, plus a required security deposit of $0, and first month's lease payment of $400. Excludes title, taxes, registration, and license fees. Total monthly payments equal $20,569. Mileage charge of $0.25 per mile over 10,000 miles. Not all consumers will qualify. Residency restrictions may apply. Finance for $791 per month at 3.9% APR for 60 months with $5,061 down payment. Payment expires on 04/30/19. Estimated Finance payment based upon 3.9% APR for 60 months, with a down payment of $5,061. Excludes title, taxes, registration, and license fees. Some customers will not qualify. See your authorized dealer for complete details on this and other offers. Residency restrictions may apply. Lease for $501/month for 39 months with $5,061 due at signing including $0 Security Deposit and 10,000 miles per year. Payment expires on 04/30/19. Estimated Lease payment based on 39 months and $5,061 due at lease signing. Cash due at signing includes $4,561 capitalization cost reduction, which includes $650 acquisition fee, plus a required security deposit of $0, and first month's lease payment of $501. Excludes title, taxes, registration, and license fees. Total monthly payments equal $24,094. Mileage charge of $0.25 per mile over 10,000 miles. Not all consumers will qualify. Residency restrictions may apply. Finance for $800 per month at 3.9% APR for 60 months with $5,114 down payment. Payment expires on 04/30/19. Estimated Finance payment based upon 3.9% APR for 60 months, with a down payment of $5,114. Excludes title, taxes, registration, and license fees. Some customers will not qualify. See your authorized dealer for complete details on this and other offers. Residency restrictions may apply. Lease for $507/month for 39 months with $5,114 due at signing including $0 Security Deposit and 10,000 miles per year. Payment expires on 04/30/19. Estimated Lease payment based on 39 months and $5,114 due at lease signing. Cash due at signing includes $4,608 capitalization cost reduction, which includes $650 acquisition fee, plus a required security deposit of $0, and first month's lease payment of $507. Excludes title, taxes, registration, and license fees. Total monthly payments equal $24,359. Mileage charge of $0.25 per mile over 10,000 miles. Not all consumers will qualify. Residency restrictions may apply. Finance for $805 per month at 3.9% APR for 60 months with $5,144 down payment. Payment expires on 04/30/19. Estimated Finance payment based upon 3.9% APR for 60 months, with a down payment of $5,144. Excludes title, taxes, registration, and license fees. Some customers will not qualify. See your authorized dealer for complete details on this and other offers. Residency restrictions may apply. Lease for $512/month for 39 months with $5,144 due at signing including $0 Security Deposit and 10,000 miles per year. Payment expires on 04/30/19. Estimated Lease payment based on 39 months and $5,144 due at lease signing. Cash due at signing includes $4,633 capitalization cost reduction, which includes $650 acquisition fee, plus a required security deposit of $0, and first month's lease payment of $512. Excludes title, taxes, registration, and license fees. Total monthly payments equal $24,567. Mileage charge of $0.25 per mile over 10,000 miles. Not all consumers will qualify. Residency restrictions may apply. Finance for $824 per month at 3.9% APR for 60 months with $5,256 down payment. Payment expires on 04/30/19. Estimated Finance payment based upon 3.9% APR for 60 months, with a down payment of $5,256. Excludes title, taxes, registration, and license fees. Some customers will not qualify. See your authorized dealer for complete details on this and other offers. Residency restrictions may apply. Lease for $524/month for 39 months with $5,256 due at signing including $0 Security Deposit and 10,000 miles per year. Payment expires on 04/30/19. Estimated Lease payment based on 39 months and $5,256 due at lease signing. Cash due at signing includes $4,733 capitalization cost reduction, which includes $650 acquisition fee, plus a required security deposit of $0, and first month's lease payment of $524. Excludes title, taxes, registration, and license fees. Total monthly payments equal $25,135. Mileage charge of $0.25 per mile over 10,000 miles. Not all consumers will qualify. Residency restrictions may apply. Finance for $848 per month at 3.9% APR for 60 months with $5,406 down payment. Payment expires on 04/30/19. Estimated Finance payment based upon 3.9% APR for 60 months, with a down payment of $5,406. Excludes title, taxes, registration, and license fees. Some customers will not qualify. See your authorized dealer for complete details on this and other offers. Residency restrictions may apply. Lease for $540/month for 39 months with $5,406 due at signing including $0 Security Deposit and 10,000 miles per year. Payment expires on 04/30/19. Estimated Lease payment based on 39 months and $5,406 due at lease signing. Cash due at signing includes $4,867 capitalization cost reduction, which includes $650 acquisition fee, plus a required security deposit of $0, and first month's lease payment of $540. Excludes title, taxes, registration, and license fees. Total monthly payments equal $25,892. Mileage charge of $0.25 per mile over 10,000 miles. Not all consumers will qualify. Residency restrictions may apply. Finance for $856 per month at 3.9% APR for 60 months with $5,453 down payment. Payment expires on 04/30/19. Estimated Finance payment based upon 3.9% APR for 60 months, with a down payment of $5,453. Excludes title, taxes, registration, and license fees. Some customers will not qualify. See your authorized dealer for complete details on this and other offers. Residency restrictions may apply. Lease for $545/month for 39 months with $5,453 due at signing including $0 Security Deposit and 10,000 miles per year. Payment expires on 04/30/19. Estimated Lease payment based on 39 months and $5,453 due at lease signing. Cash due at signing includes $4,909 capitalization cost reduction, which includes $650 acquisition fee, plus a required security deposit of $0, and first month's lease payment of $545. Excludes title, taxes, registration, and license fees. Total monthly payments equal $26,129. Mileage charge of $0.25 per mile over 10,000 miles. Not all consumers will qualify. Residency restrictions may apply. 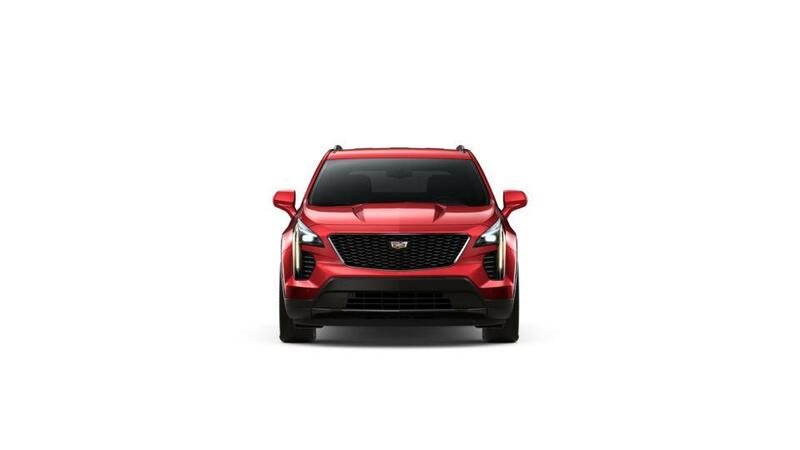 Learn more about the all Cadillac XT4 at Cable Dahmer Cadillac of Kansas City. Call 888-202-4773 or visit us near Overland Park, Olathe, and Lee's Summit to test-drive a all Cadillac XT4 today.